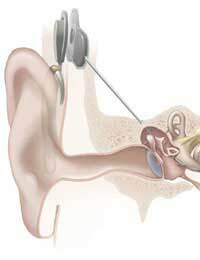 Home > Ear Treatments > How Does a Cochlear Implant Work? A cochlear implant works in a completely different way to a hearing aid. Instead of amplifying the sounds to make it easier for a partially deaf person to hear, a cochlear implant transmits information from sound waves directly to different parts of the auditory nerve, bypassing the normal route through the ear. The ‘sounds’ that are picked up by the brain and decoded are not the same as sounds perceived through normal hearing but they provide enough information to allow someone who is completely and profoundly deaf to hear and understand speech and to recognise other sounds. There are many different types of cochlear implant but they all have similar components. Each has a microphone that is attached to the outside of the skull, usually very close to the pinna of the ear. This is quite small and is usually tucked away between the ear flap and the side of the head, so that it is hardly noticeable. This links to a speech and sound processor that turns the sound waves and vibrations picked up into electrical signals. These are sent to an adjacent transmitter that is implanted under the skin of the ear. This is linked directly to the bone inside the ear via a long thin connector, slightly thicker than a needle. Another tiny part of the cochlear implant, the electrode ray, is implanted directly inside the cochlear, and makes links to the auditory nerve. Sound waves picked up by the microphone are converted to electrical signals and sent to the receiver, which passes them on to the transmitter. This then transmits vibrations through the connecting device into skull bones. These are picked up by the electrode array inside the cochlear and turned once again into electrical impulses. These stimulate different parts of the auditory nerve and are sent to the brain to be decoded. The result is that the person with the implant can ‘hear’, or at least detect sounds from the outside world, even though they are profoundly deaf. This can take time. For someone who has been able to hear normally in the past, re-learning to interpret sounds again is difficult but intensive training usually works quite quickly. Most people who have become deaf as adults are able to learn to recognised speech without clues from lip movements and are able to hold conversations again, even ones over the phone. For children who are born profoundly deaf, much more training and therapy is needed. With a lot of help, a child of three can learn to recognised sounds and can then catch up on speech development and on social skills by the time they enter school. In the USA, the first cochlear implant for a child as young as 12 months was approved recently; early implantation should help children develop their sense of hearing with the implant more quickly. Although cochlear implants have only been available for a few years, a total of 190 000 people had been given one by the end of 2009. The technology that has helped to develop cochlear implants is advancing rapidly and new generations of cochlear implants that can help people pick up sounds of different frequencies are being developed. It may become possible to have different types of cochlear implanted in the two different years, so that the overall experience of sound from the outside world can be improved to shorten learning time.